Young powerboaters from across the UK will be hitting the water on Sunday 16 September at TheYachtmMarket.com Southampton Boat Show, putting their skill, control, and speed to the test in the hope of clinching the prestigious title of 2018 Honda RYA Youth RIB National Champion. 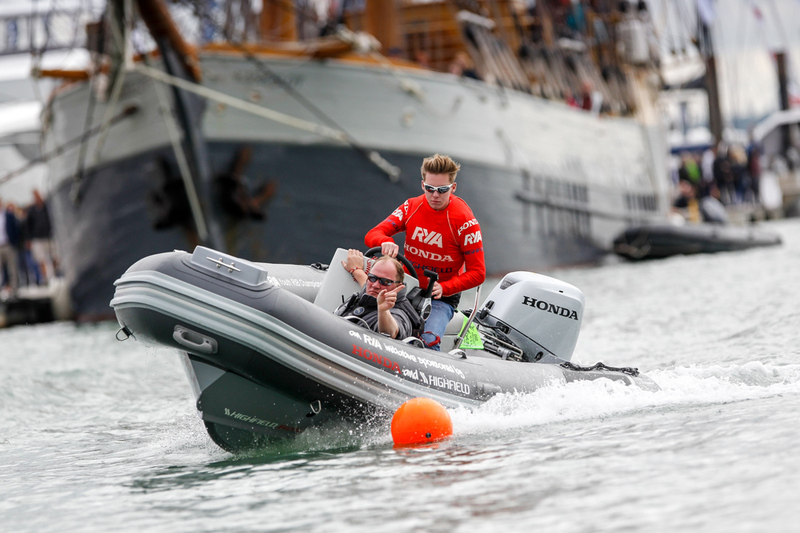 The Honda RYA Youth RIB Championship is Britain's leading programme introducing kids to powerboats and training them to be safe, proficient drivers and excellent boat handlers. Throughout the summer the competition has seen some very close finishes at the area finals and this year's final promises to be a real nail biter! "It's been a great few months and competition has been tight. It's always good see new competitors taking part as well as seeing youngsters return year on year to try and improve on their times. The competitors really give it their all on the course", commented Steff Evans, Honda RYA RIB Youth Championship, National Event Manager. "It's wonderful to see rivalries on the water put aside when competitors return to shore and see them consoling each other if laps haven't gone as well as they hoped. "The skill of the competitors who have made it to this year's national final means we are going to have a close fought battle to see who can become this year's National Champion in both age categories." Steff added. In the 08-12 age group look out 12 year old Oban Duncan, who set a blistering Area Final time and sits at the top of leader board table, clinching the fastest lap time across both the 8-12 and 13-16 age groups. Oban has her eyes firmly set on the winner's crown; she commented: "I was nervous when I first went out but after the first lap it's got easier. I am really looking forward to heading to Southampton this year after setting this time." With just over 2 seconds separating the top four fastest lap times set at the Area Finals in the 13-16 age group, the final is looking set to be a close fought battle. Jamie Paterson from Scotland heads the leader board but with George Baxter from the Midlands and Alice Wood representing the South and James Colquitt representing the North West close on his heels, the crown could belong to anyone. "I can't wait until September!" James commented. Competitors from Scotland will kick start the national final at 09:30am, with racing continuing throughout the day until approx.15.00, off Solent Park. The course will involve tricky timed manoeuvres, including a high speed slalom, stop exercise, and a blast to the finish line, to test every aspect of the youngsters' powerboat driving skills. Now in its 17th year, finalists will be battling it out on the water in the hope of winning a fantastic prize. In the 8-12 age group the championship winner will receive a Honwave T40 RIB with a Honda BF20 engine for their club, whilst in the 13-16 age group the winner will receive, again for their club, a Highfield OM460 RIB with a Honda BF50 engine. Medals, certificates and other prizes will also be presented to the first, second and third places in each age group. Join us on the Honda Stand (E070) at approximately 16.30 for the prize giving. Andrew Norton, RYA Powerboat Project Manager and Event Director said: "With so many talented young RIB drivers across the country the 2018 titles and the Champion of Clubs trophy could belong to anyone. "Qualifying for the national final of the Honda RYA Youth RIB Championship is a huge achievement as it not only means that these youngsters can drive the RIBs at speed but they can handle them safely under pressure. "There are plenty of places around the race course area for visitors to watch all the action so please come along and cheer on the competitors." RIBs are light, manoeuvrable craft and the boats driven in the Honda RYA Youth RIB Championship can hit speeds of up to 25mph. Steve Morris, Head of Power Equipment for Honda (UK) comments: "We are pleased to continue our long and successful partnership with the RYA in supporting the Honda RYA Youth RIB Championship in its sixteenth year. "Honda and our boat partner Highfield are delighted to support the RYA in its endeavours to motivate and encourage young people to develop their skills and to promote safe and responsible racing through this unique and exciting championship."